chessclassesinbrooklyn « Chess classes in Brooklyn. There are a few slots left available for the summer chess camp in the last two second weeks of August (the weeks of Aug 21st and Aug 28th). The camp schedule is from Monday to Friday from 9 to 12 each week. The camp location is the JEI Learning Center at 7721 18th Avenue in Bensonhurst, Brooklyn, which has also been hosting ongoing weekend chess classes and tournaments. The camp sessions are designed for small groups of kids between 4 and 12 years old at various levels of chess skill level- from complete beginners to seasoned tournament players. Classes are conducted by an expert-level player. Please contact me here about more detailed info. Following our recent successful tournament at JEI Learning Center in Bensonhurst, Brooklyn, we continue the classes on Saturday mornings for kids of ages 4 and up in the month of June and throughout the entire summer. 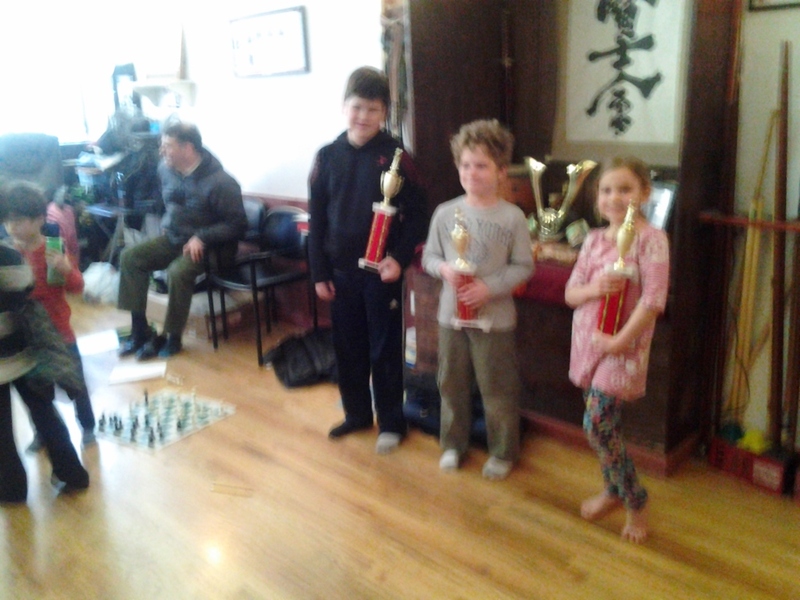 Several kids who learned their first chess moves at JEI have grown up to become regular tournament players. New students are always welcome! 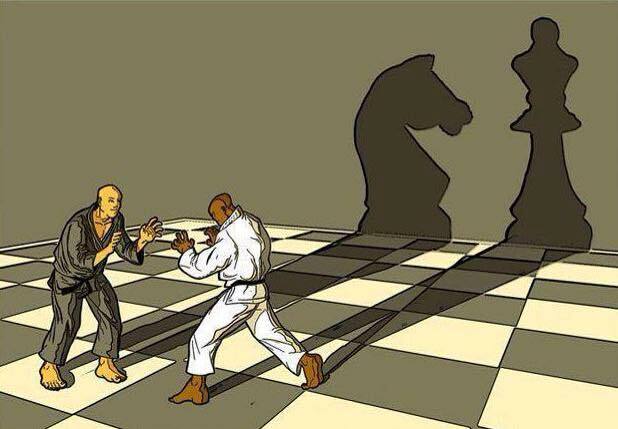 The classes meet at 10 am for the advanced group and at 11 for the beginner group. To sign up for the classes, please contact the JEI Learning Center at (718)534-6990 or 18ave@jeibrooklyn.com , or stop by at 7721 18th Ave .
Today was the first tournament ever at the karate studio UWS Kenshikai on Upper West Side. Chess is loved by the martial artists and many of the kids practice both, so it was a great opportunity to all of the chess kids who come to the UWS Kenshikai Dojo to do karate to compete on the 64 squares this time. We had 18 kids in two different sections, the youngest players were 5 years old! Everybody had a great time and took a nice trophy award home. More tournaments are coming soon! Rapid rated tournaments with money prizes every Saturday starting in Brooklyn next month ! 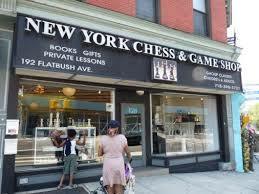 Beginning on April 18th, the New York Chess and Game shop at 192 Flatbush Ave will be hosting rapid tournaments on Saturday evenings (every week at 7, 4 rounds G/30, games will be USCF-rated). This is great news for the revival of the tournament scene in Brooklyn! Please check the event website here and make sure to bookmark the date in your calendar! Chess tournament for kids on Upper West Side on March 29th! 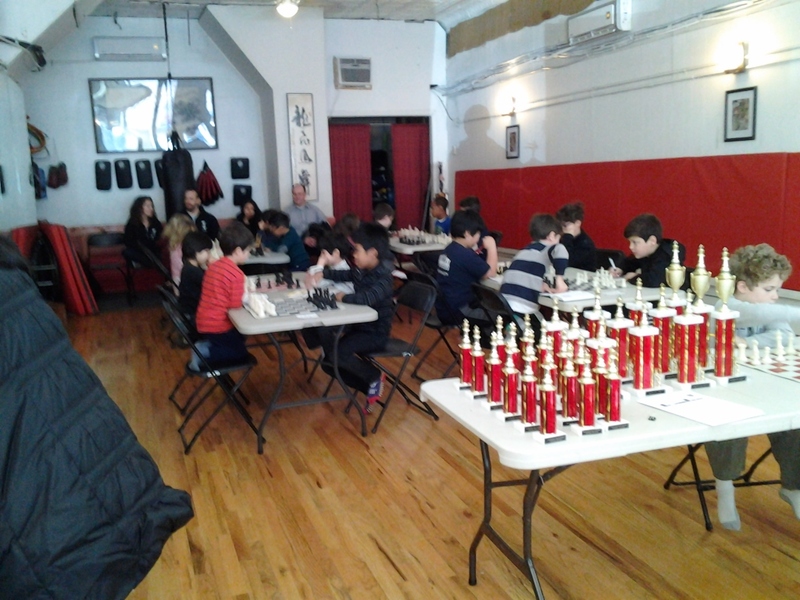 Scholastic chess tournament at the JEI Center in Bensonhurst, Brooklyn- info and registration. AFTER A GREAT TOURNAMENT IN BENSONHURST EARLIER THIS YEAR WE’RE DOING IT AGAIN! COME AND BE A PART OF OUR GROWING HISTORY! FUN EVENT FOR YOUNG PLAYERS OF ALL LEVELS WITH GREAT TROPHY AWARDS! 4 rounds G/30. Please bring sets and clocks. USCF membership required for the U-900 and Open Sections (or could register at the site), not required for the unrated section. Ages 15 and under. The entry fee is $30 , please use the PayPal button below for payment. Thank you very much for registration, we’re looking forward to seeing you at the tournament! 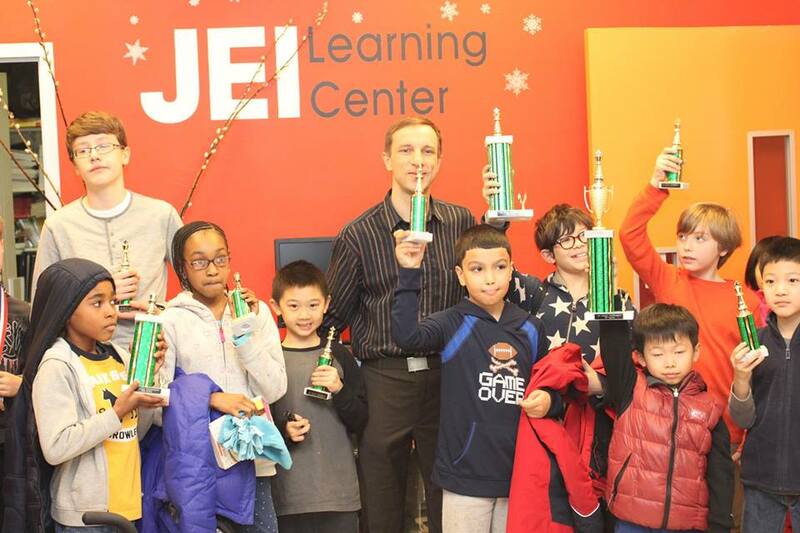 Click here for more pictures from our previous JEI tournament!